Long-time console headset maker Turtle Beach marks its return to PC gaming with a worthwhile offering tailored to esports players and Twitch streamers alike. Upon opening the packaging for its $99 Elite Atlas gaming headset, Turtle Beach doesn't shy away from a friendly introduction. In the box, the headphones themselves are joined by a few carefully placed materials. Enclosed in a CD sleeve labeled "Literature" is an instruction booklet, accompanied by Australian warranty information and a well-concealed Turtle Beach sticker I'll wind up slapping on my laptop. Behind that is a square sheet of black poster paper decorated with marketing copy sandwiched between two mostly forgettable slogans. A three-paragraph mission statement is followed by the words: "This headset was built for those who despise mediocrity." Enticing as that sounds, the real reason the Elite Atlas exists is to accommodate the the deluge of PC gamers that's emerged as a result of the thriving global esports industry, especially in areas like Southeast Asia, South Korea and South Africa. With that in mind, it doesn't take a genius to see why a company like Turtle Beach would be interested in expanding its reach, beyond the console crowd it largely appeals to now. To devise a headset that puts PC gamers first, Turtle Beach worked with its partners—including Astralis, the top ranking CS:GO team in the world—to assess the ideal audio curves for the average everyday global esports champion. And compared to someone like me, who primarily avoids online multiplayer games in favor of story-driven single player adventures, video game athletes have more specific needs when it comes to sound quality. Rather than clamoring for the loudest, bassiest explosions in every scripted action game set piece, esports players demand pristine voice chat clarity. Because success almost always depends on effective communication in the world of competitive gaming, the Turtle Beach Elite Atlas is primed to exhibit clear mic audio above all else. By utilizing its own "TruSpeak" technology, Turtle Beach claims background noise is eliminated and, to that end, your own voice is amplified when using the detachable boom. Although I mainly play offline, this noise-cancelling feat does prove useful in the rare event that I decide to air my gameplay on Twitch. In order to test out the equipped boom mic, over the weekend I broadcasted to the world my 30-minute playthrough of the Resident Evil 2 "1-Shot" demo, sporting the Turtle Beach Elite Atlas through it all. While my stream was initially jarring for viewers due to a reverberation effect that I blame entirely on XSplit and not myself, once rectified, my audience complimented the lucidity of my voice off in the chat bar. Little did they know, amid my trials and errors playing through a vertical slice of a remake of a PlayStation 1 game, I was using my viewers to garner feedback about the quality of my mic. At the same time, I recorded the footage to my hard drive and returned to it several hours later to reexamine my input levels. In the video, it seemed as though the gain was too high. Whenever it was raised much beyond its normal volume, my voice would crackle, as if I was recording voice-over... outside.... on a windy day... with no pop filter. To that same end, I could hear myself breathing heavily on more than one occasion. And, I have to say, it wasn't flattering. Unfortunately, seeing as Turtle Beach neglected to develop native software for the Elite Atlas, adjusting audio levels is limited to what's possible in Windows 10's finite selection of controls. That being said, when attached to the headset, the mic did an excellent job of isolating my deadpan commentary from the disruptive banter of my roommates watching TV on the other side of my door. The cans themselves, on the other hand, could benefit from their own form of noise cancellation. As I'm writing this review, even with my music blaring at the highest volume, I'm distracted by the sound of my coworkers filming a news report behind me. Having forgotten my best-in-class Sony 1000XM3 noise-cancelling headphones at home today, frankly the Turtle Beach Elite Atlas is no suitable replacement. In terms of output quality, the Elite Atlas headphones are par for the course. Leveraging two 50mm Nanoclear drivers, the cans are capable of producing a frequency response between 12Hz and 20kHz. Yet, despite its wide range of signal frequencies, based on my own experience using Turtle Beach's PC-first gaming headset, it is evident that the bass, sub-bass and high-end bands all take precedence over midrange and low-midrange sounds. Only in extreme action-packed moments is the stereo headset likely to impress. In the vast majority of games, mids dominate the audio, leaving me with a lot to be desired from this headset's sound. I suppose in that sense, the Turtle Beach Elite Atlas prefers form over function. Extending from the base of the left headphone is a 3.3-foot 3.5mm braided aux cable that accompanies the headset in its aforementioned packaging. The cord itself is a little bit finicky, often requiring that I turn the headset end of the connector ever so slightly before I start to hear noise emerge from both speakers. I also find it particularly vexing that the cable is restricted to a single orientation. A sticker which reads "connect this end to headset" commands your attention every time you deject and then reinsert the connector. Located about a quarter of the way down its torso, the Elite Atlas' main audio cable is furnished with a basic set of in-line controls. Made of plastic, with rubber ends on either side tightly gripping the insulated wire, this control panel lets you turn up and down the volume using a simple scroll wheel or even mute your mic when it's not in use. The headset also comes with a PC splitter that doubles as an extension cord, effectively bumping the total cable length up to a far-reaching 9.8 feet. However, by connecting it, you're agreeing to plug the PC end of the splitter into the discrete pink and green (mic and headphone) jacks on your motherboard. It's a shame that the Turtle Beach Elite Atlas isn't wireless because, for this price, you could go ahead and buy the Corsair Void Pro or the SteelSeries 5, both of which transmit a similar range of frequencies over wireless 2.4GHz. For serious PC players, wireless is all but essential in a competent gaming headset. Without it, you may have to rethink the layout of your setup. Unless you're sitting well under 10 feet away from the back of your tower, you better hope your keyboard has audio passthrough. Otherwise, perhaps tragically, you'll be tethered to a controller. RGB lighting is absent from the Elite Atlas as well, though that's probably for the best. All told, the Turtle Beach Elite Atlas is comfortable to wear. Enveloped in a soft-touch leather material running along the sides, and an athletic fabric gently kissing the sides of your face, the memory foam cushioned earcups are spacious and unobtrusive. In that regard, it's reminiscent of the Razer Nari Ultimate I reviewed last month. Keeping the earcups in place is a sturdy metal headband. Meanwhile, glasses wearers like myself will appreciate the implementation of Turtle Beach's patented ProSpecs "glasses relief system," much as it's probably responsible for headset's infrequent-but-still-annoying downhill slippage. I have to say, it's disconcerting how much of the Elite Atlas came apart as I took it out of the box. Not only are you able to remove the speaker plates on the outside of each can for cosmetic personalization, but the earcups themselves adhere magnetically to each speaker. But once I found out why this was happening, my apprehension transformed into commendation. Turtle Beach has made it so just about every aspect of the headset is replaceable should it be lost or damaged. That's subversive in a market where you're normally screwed every time one of your fancy toys breaks. 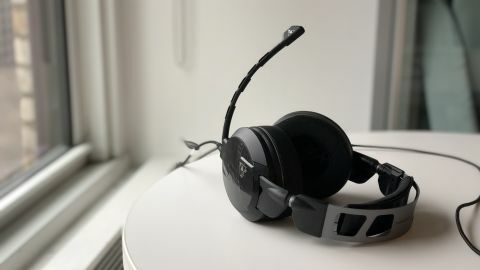 As a stab at constructing a gaming headset for PC, the Turtle Beach Elite Atlas is an auspicious product, characterized more by what it could be than what it is right now. Whereas the first headset I ever reviewed, the Nari Ultimate, demonstrated the resounding effects of haptic feedback in a headset, the Elite Atlas' triumphs are subtler. Pricey as it appears at first blush, its modularity is a would-be money-saver for the careless and clumsy, its cozy muffs are roomy and relatively tight-fitting and, best of all, voice chat is shockingly intelligible. If only the speakers sounded better, then I'd be reaching for the Elite Atlas every time I boot up my rig.